Donnie Eichar's “Dead Mountain” offers a novel explanation for one of the great unsolved mysteries of Russian history. 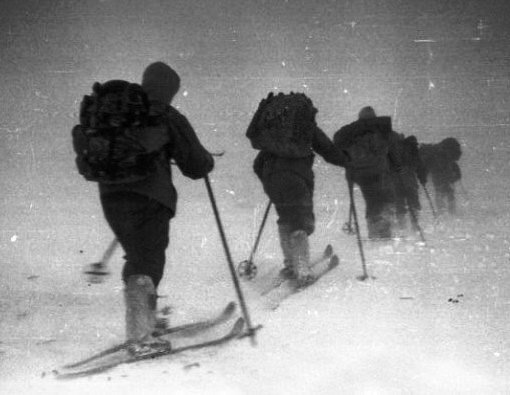 The Dyatlov group skiing towards the location of their final campsite, February 1, 1959. In January 1959, a group of students from Ural Polytechnic Institute in the Russian city of Sverdlovsk set out on an ambitious winter hiking/skiing trip, their ultimate destination: Otorten Mountain in the northern Urals. One of the ten hikers, Yuri Yudin, turned back midway through the trip due to health concerns, a decision that saved his life. Weeks later, after the other nine failed to return home, a search party began combing over a large swath of remote wilderness. Within a few days the searchers located the group’s tent, but found no trace of its former inhabitants. The hikers—who would subsequently become known as the Dyatlov group, a reference to 23-year-old leader, Igor Dyatlov—had made camp on the gentle eastern slope of windswept Holatchahl mountain, which means “Dead Mountain” in Mansi, the language spoken by the indigenous people of the region. In the ensuing months, search parties would discover the bodies of all nine students, in separate locations, all approximately a mile from their camp site. The seven men and two women were found half-dressed, nearly all without boots (left behind in their tent) and some without socks. Autopsies would reveal that six of the nine died from hypothermia, but three were deemed to have perished from violent injuries, with one victim missing her tongue. Adding to the mystery, a radiologist determined that the hikers’ clothing contained abnormal levels of radiation, and it was established that the group’s tent had been cut open from the inside out. What no one could explain was what possessed the inadequately-dressed skier-hikers to venture away from their only source of shelter into the bitter cold of a dark, windy, midwinter night. More than five decades later, the overwhelming majority of Russians remain familiar with the case, and many are quick to opine about what might have occurred. Potential explanations include: murder at the hands of the military, escaped prisoner attack, avalanche, and death by nuclear waste. But it wasn’t until earlier this year that Donnie Eichar, an American film and television producer from Malibu, California, presented a new and entirely plausible scientific explanation for what happened. Eichar spent four years investigating the case and took two trips to Russia, during which time he gained access to the group’s journals and photographs, as well as previously unreleased data and criminal case files. He also interviewed friends and family members of the hikers, including the aforementioned Yudin, who shared his recollections before passing away earlier this year. Last but not least, Eichar attempted to retrace the group’s steps—during the winter, of course—all the way from Yekaterinburg (Sverdlovsk in the Soviet era) to the site of the fatalities, a place now known as Dyatlov Pass, in memory of the hikers. In “Dead Mountain: The Untold True Story of the Dyatlov Pass Incident” (Chronicle Books), Eichar recounts the trials and tribulations of his trips to Russia, and reconstructs the Dyatlov group’s trip, with a strong assist from both Yudin and Yuri Kuntsevich, the latter the president of the Dyatlov Foundation, whose mission is to preserve the memories of the hikers and uncover the truth behind the tragedy. In the end, the author presents a thoroughly modern explanation for the hikers’ seemingly irrational behavior and subsequent deaths, one which he developed in conjunction with Dr. Alfred J. Bedard, Jr., and other researchers at the National Oceanic and Atmospheric Administration (NOAA) in Boulder, Colorado. While Eichar prefers to save the details for those who read the book, suffice to say that his theory involves a particular type of repetitive wind event (one that could be produced by the topography of Dead Mountain), which in turn might have triggered panic-inducing infrasound. Earlier this month, Eichar spoke with Failure about the challenges of researching the Dyatlov Pass incident, which has spawned more than its share of conspiracy theories. What did you learn when you retraced the hikers’ steps? The experience of retracing the hikers’ footsteps was surreal because I grew up in Florida and I’ve been living in Southern California for the past fifteen years. It was not the most likely place for me to be, at the gateway to Siberia, in those subzero temperatures. But I figured if I was going to dive in to the subject I would have to retrace the hikers’ steps both literally and figuratively. 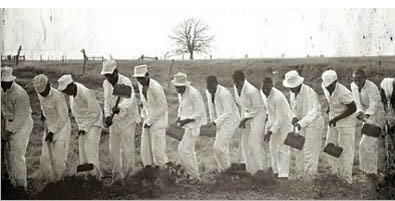 I started at their dorms and I rode the same trains and stopped at the school where they sang songs to schoolchildren. I also stopped at Ivdel, which used to be the Gulag capital of Russia, before I finally got to the mountaintop where they set their tent that final night. One important thing I learned is that it’s extremely difficult to walk in snow ranging from six inches deep to knee deep in subzero weather. That made me think about the hikers and how they walked a mile in those conditions, insufficiently clothed, at night, leaving a perfectly good tent to do so. That’s when it occurred to me that there was an event that took place—that they must have recognized the risk involved [with leaving their tent]. That was one of the biggest epiphanies I had when I was standing on that mountaintop. Paint a picture of what it’s like at Dead Mountain in winter. The picture in the book is reminiscent of a moonscape. That’s a great description. It did look like a moonscape. My instinct told me right away: Why do you want to go up there? There’s nothing there. There’s no life—no vegetation and no trees—because the conditions are so harsh. It’s not a place that holds any sense of beauty. That’s why the Mansi named it Dead Mountain. But I knew I had to go up there in order to get where I needed to go. How far is Dead Mountain from any kind of civilization? How far would you have to go to receive medical treatment if you, say, got frostbite? It depends on your mode of transportation. My base camp was in Ushma, a Mansi village [on the Lozva River] with no running water or electricity, which is thirty miles away. From there you have an eight-hour truck ride to the nearest town that would have a hospital—and the facilities there are not good. That was a big worry for me because [in the event you need medical treatment] you are looking at thirty-plus hours of trying to get to a hospital. And I have vertigo, so going into conditions where you are possibly going to experience a whiteout … well, that is not a smart thing to do. I am not a pill-popper by any means, but I brought valium. Which of the nine hikers do you find particularly fascinating or notable? Igor Dyatlov, the leader of the group. He was this Jack London character. As I was interviewing his family and friends I got the image of a man’s-man and gentleman adventurer. He was a published photographer at any early age and he built handheld radios so he could stay in touch with his friends. He had a whole wall in his bedroom that was covered with radio receivers and he built a telescope for his family to see the first Sputnik in 1957. I really admire him and admire all the hikers. I identified with their innocence, going out there and trying to conquer the distance simply to do it. I also have to make a quick note about Yudin. He eluded journalists and reporters for over half a century and never told his story. I found him on my second trip [to Russia] and developed a great relationship with him. It took a few days for him to trust me, but without him the story could never have been told. He filled in the details between the hikers’ journal entries and the photos that were recovered from their cameras. There was no one else that could do that because he was the last one who saw them alive. I spent two weeks interviewing him, and he died shortly afterwards. Was it a challenge to earn the trust of the Russians you interviewed? How did you earn their trust? It was a challenge. When I went to interview Yuri Yudin, there was no translator there initially. So we sat having tea and just stared at each other from across the table. It was a good forty-five minutes before the translator finally showed up. The first thing he said to me was: “Don’t you have mysteries in your own country?” I had been trying to find this man for two-and-a-half years and I had traveled all that way and that’s what he came up with. Then he told me to put away my “Cold War tape recorder” and proceeded to interview me for an hour before he would let me interview him. That was the process with the majority of the Russians who I interviewed. They would play this cat-and-mouse game with me before I would establish their trust and then they would let me interview them. I think they thought I was a bit of a crazy American because they would say: You didn’t know these hikers and you’re not Russian. So why do you care? How did you gain access to the hikers’ journals and pictures? The photos in the book really help the reader visualize what the students were like and what they were up to. One of the first things I did was to call Yuri Kuntsevich. He wouldn’t give me much information at first. Finally he said: If you want to know the truth of this story you need to come to Russia. So I jumped on a plane having no idea what I was getting into. When I arrived I was taken in like family. I didn’t stay in a hotel the whole time I was in Russia. And every day, new information would be uncovered there in his living room. He had the hikers’ photos and journals and the criminal case files and search & rescue photos. He trusted that I was going to do the best I could to tell the story. What are some of the primary conspiracy theories you encountered during your research? One theory is that the Mansi came to the camp and killed the hikers because they were on a religious site. But the Mansi are a very peaceful people and they assisted with the search operation. Also, there’s the notion that the hikers stumbled on a military weapons testing site and they were killed because they saw something they shouldn’t have. I also heard that escaped convicts from a Gulag might have killed the hikers, though the nearest Gulag was sixty miles away. In Russia, what is the most commonly accepted explanation for what happened? The most common theory is that the government was involved and there was some type of cover-up. The Russians, in my experience, don’t trust their government. The problem is that no one had a logical reason behind what the government might have done or why they would have killed the hikers. In terms of public interest, is there an unsolved mystery-type incident in the U.S. that would be comparable? The majority of people in Russia have heard of the incident. And it’s very well-known with the older generations. It was a big story at the time. When they had the funeral[s] thousands of people came out onto the street. I was trying to get a sense of how big the story is in Russia and quite a few people compared it to the JFK assassination. So why did the hikers leave their tent? The final conclusion of lead investigator Lev Ivanov was that the hikers died because of an “unknown compelling force.” It was the only one of his cases that remained unsolved and it haunted him for the rest of his life. But his conclusion was correct for the time. He couldn’t explain what happened because he lacked the science and technology to do so. The conclusion that I have come up with could only have happened with the help of modern science and the help of the National Oceanic and Atmospheric Administration. Interestingly enough, it was a group of Russian scientists that I worked with, as well as an American. What can we learn from this incident? What is your takeaway? My takeaway is that sometimes there’s a tragedy but there’s not a villain. I think we always want to have a villain and attach it to every tragedy, but sometimes it’s just an unfortunate set of circumstances that occurs. And that’s scary to people. 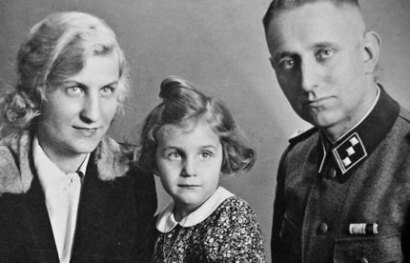 The Perfect Nazi—BBC filmmaker Martin Davidson confronts the fact that his grandfather was an unrepentant Nazi. Thomas Eakins—A modest commercial and critical success in life, an Old Master after death. Land of the Less-Free—Robert Perkinson, author of “Texas Tough,” on America’s failed policy of mass incarceration.